Devised by the company, based on Vladimir Nabokov’s writing. This is an absurdist, bleak and hilarious exploration of a man waiting for his execution. We’re herded into the black box of the theatre, where there is a smaller, white box which we’re herded into in turn. As the audience files in, we find an awkward lawyer trying to see out of a window not designed to be seen out of, and an exhausted gaoler blaring music from a transistor radio. The last person enters – the door swings shut and the gaoler locks it. The audience shares the cell and the concomitant decent into madness with the prisoner. What did the prisoner do? Never discussed. Unimportant. Greg McLaren presents a resigned prisoner whose flashes of despair, passion, and humour make him consistently engaging, despite or perhaps because of his long silences. He scrawls messages and drawings on the floor of the cell, which we all crane to see. What is he drawing with? A pencil, presented to him and regularly sharpened by his gaoler, Tom Lyall, an aspiring poet who has a scene-stealing romance with a spider in the corner of the cell. This gaoler is not an authority figure as much as a cellmate – he is trapped by his repeated actions, where the prisoner is only limited by the walls of his cell and, of course, time. When is his beheading? Um – the lawyer can’t seem to tell him. 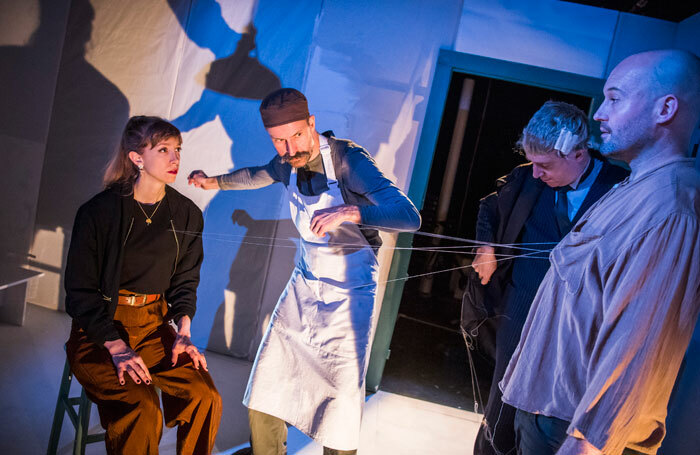 The lawyer, Simon Kane, is possibly the funniest figure in an incredibly funny play – shabby, meandering, vaguely optimistic and utterly useless. He pops in at inopportune times to say almost nothing – including when the prisoner was preparing for a visit. Who visits this condemned man? His wife – though they can find nothing to say to each other, nothing to provide closure for whatever they had before he was confined. Shamira Turner does so much with very little – her physicality does most of the work, even in tiny apertures. The set by Zekan Cemal is claustrophobic but playful and surprising – supported by really clever lighting, designed by Richard Williamson. The sound design by Elanor Isherwood (Ben Ringham consulting) carries the audience into the madness of an impending execution. The show was conceived and directed by Gemma Brockis, a co-founder of Shunt, who may be remembered for their creative site-based performances through the early 2000’s. She’s created a really excellent experience that leaves the audience shaken. It’s an unpredictable, enjoyable but brutal show, that I highly recommend to those looking for properly good weird theatre.